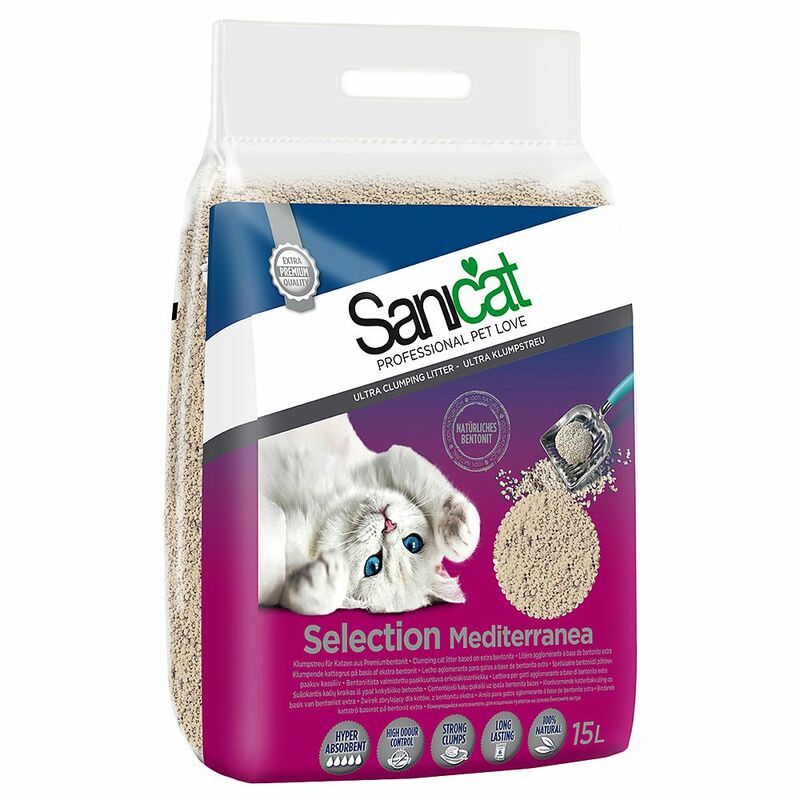 Sanicat Selection Mediterranea clumping cat litter is made from premium bentonite, a highly effective material. Bentonite is highly absorbent and forms ultra-compact clumps that do not disintegrate, and so are easy to separate out and remove from the rest of the litter in the tray. The litter also binds and neutralises the urine odour, protecting your home from unwanted smells. This natural cat litter is soft on the cat's paws, and does not contain any additives. It distinguishes itself from other litters thanks to its high performance and long-lasting effects: The Bentonite provides 6 weeks of hygiene and freshneΒ in the litter tray. An innovative and efficient litter that can't be beaten for comfort and practicality! Sanicat Selection Mediterranea Clumping Litter at a glance: Clumping cat litter Premium Bentonite: Made from high quality, effective material Ultra-compakt clumps: Forms very solid clumps that stick together and don't desintegrate Very high absorbency: Effectively locks in odours Long-lasting: High performance with up to 6 weeks' effect 100% natural: No added chemical ingredients, soft on cat paws High comfort: Maximum hygiene, easy to use and maintain Bag with practical carry handle.